Gupta (right), with sons Shraiy (left) and Ishan (center). Everyone that meets Rakesh Gupta agrees: his enthusiasm and energy is contagious. Especially when it comes to Jr. Team Tennis (JTT). It started last year, when Gupta’s 8-year-old son, Ishan, joined a Jr. Team Tennis squad at Mercer County Park. It soon became a family event. During each match, Gupta and his wife, Prabha, attended the events with their eldest son, Shraiy. They cheered for Ishan and his teammates and enjoyed the tennis facility at Mercer County Park. 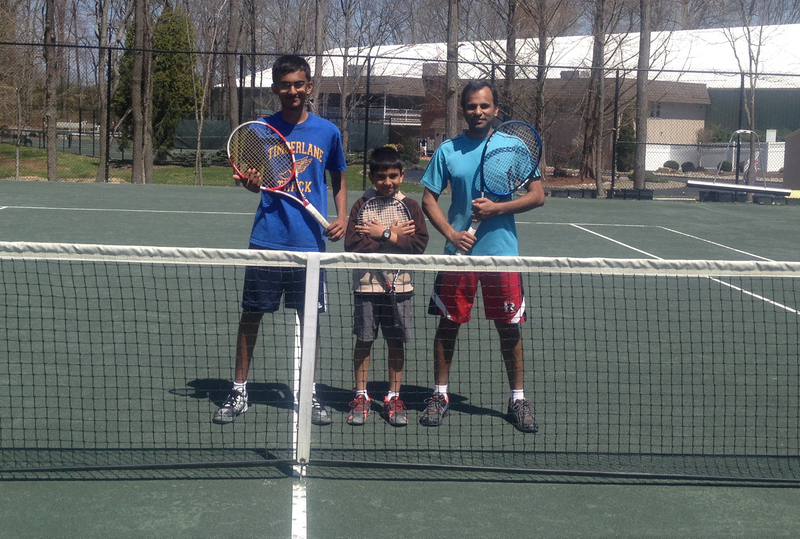 In January, Shraiy joined a team at Nassau Tennis Club, and Rakesh became the team’s manager and coach. Rakesh enjoyed the experience so much that in March of 2014 he became Ishan’s manager. Shraiy even joined as an assistant manager. But what is it, exactly, that makes Rakesh a special coach? It could just be that Gupta simply loves tennis and spending time sharing his passion for the sport. One of the many things that makes Gupta such a great coach is his style. He understands the importance of changing a coaching approach when working with children. One of the many benefits of working with children is their nature when playing. They like to learn, but they also like to go out and have fun. When they learn new things, they are excited to try them and continue to get better. For Gupta, there are many moments in coaching Jr. Team Tennis that can be classified as favorites. There was the moment he was first asked to become a JTT coach; or when he started coaching older, high school-aged players. But there is one aspect of coaching that Gupta really loves. Another unique coaching aspect is getting to work with his son, Shariy. To learn more about Jr. Team Tennis, click here.